After a few weeks of wiggling, Dylan lost his first tooth last night!! It has been really wiggly lately, but I wasn't about to pull and leave my son, or myself, traumatized. It looked like I had nothing to fear though because Dylan happily pulled his own tooth and just thought it was the coolest thing ever. I am not sure what he was more excited about...that he lost a tooth and could show his teacher tomorrow or the thought of the tooth fairy. 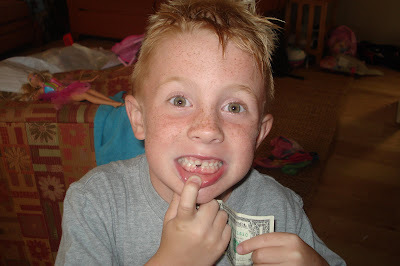 As I was tucking him in bed last night the idea of how much money the tooth fairy would leave was dancing in his head. I asked him how much he thought she may leave and he said, "Mom, how would I know...this is my first one!" Well then! 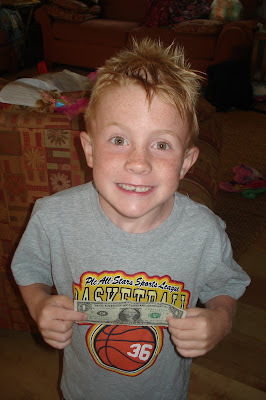 I did tell him that she left me a quarter when I was a little girl and he thought that was hilarous. The tooth fairy did come overnight and left $1 (talk about inflation) and he was super excited to show it to me this morning. I love having kids!! It is almost like we are given a second chance at living again by sharing all the newness and excitement of life that they get to experience! !